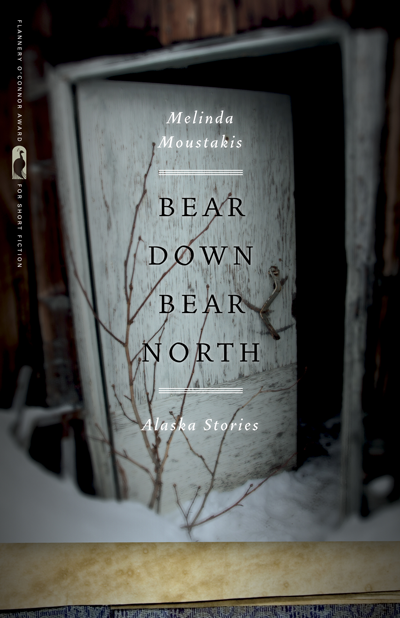 In her debut collection, Melinda Moustakis brings to life a rough-and-tumble family of Alaskan homesteaders through a series of linked stories. Born in Alaska herself to a family with a homesteading legacy, Moustakis examines the near-mythological accounts of the Alaskan wilderness that are her inheritance and probes the question of what it means to live up to larger-than-life expectations for toughness and survival. The characters in Bear Down, Bear North are salt-tongued fishermen, fisherwomen, and hunters, scrappy storytellers who put themselves in the path of destruction—sometimes a harsh snowstorm, sometimes each other—and live to tell the tale. While backtrolling for kings on the Kenai River or filleting the catch of the Halibut Hellion with marvelous speed, these characters recount the gamble they took that didn’t pay off, or they expound on how not only does Uncle Too-Soon need a girlfriend, the whole state of Alaska needs a girlfriend. A story like “The Mannequin at Soldotna” takes snapshots: a doctor tends to an injured fisherman, a man covets another man’s green fishing lure, a girl is found in the river with a bullet in her head. Another story offers an easy moment with a difficult mother, when she reaches out to touch a breaching whale. This is a book about taking a fishhook in the eye, about drinking cranberry lick and Jippers and smoking Big-Z cigars. This is a book about the one good joke, or the one night lit up with stars, that might get you through the winter.